We were so blessed to have met one of our talented chef & restaurateur clients from Chennai, South India. He makes such amazing South Indian food. He totally blew me away with the most simple yet delicious Dosa. Before working with him, Indian food to me was just butter chicken, samosas, tandoori, naan, or curries. We didn’t know how much we were missing out! Indian food is full of exciting spices, aromatic herbs, and chilies. It has a lot of complexity and depths of flavors and fragrances. There’s still so much more Indian food for us to explore!! We love eating lamb, so when we saw a bag of “bone-in goat meat (shoulder) for stewing” sitting right next to where we usually buy our lamb. We immediately jumped on it. 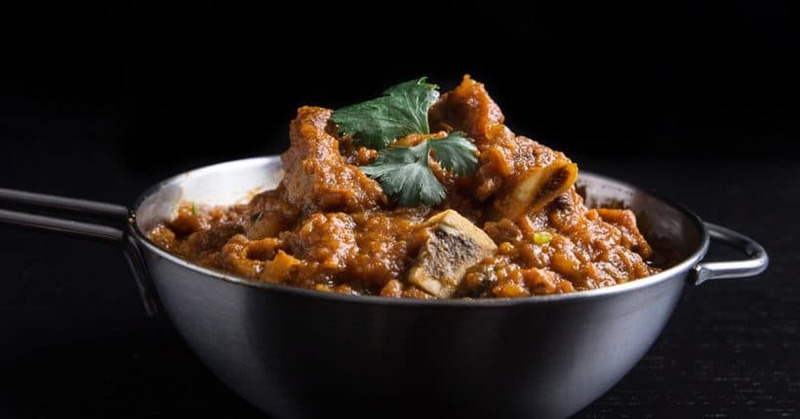 Goat meat is somewhat a healthier and more flavorful version of lamb as it contains less cholesterol, fat, and protein than lamb (and beef too). Heat up your pressure cooker. Instant Pot Users: press Sauté button and click the adjust button to go to Sauté More function. Make sure your pot is as hot as it can be when you place the goat shoulder in the pot (Instant Pot: wait until the indicator says HOT). *Pro Tip: If you are using frozen goat shoulder meat, be careful. Add 1 tablespoon of olive oil in the pot. Ensure to coat the oil over whole bottom of the pot. Add the goat shoulder in the pot. Add in 2 pinches of kosher salt and black pepper. Then, brown the goat shoulder on all sides (total: roughly 5 minutes). Add 1 tablespoon of olive oil in the pot, then add in sliced onion, minced ginger and shallot, then stir for roughly a minute. Add the minced garlic and stir for roughly 30 seconds until fragrant. Add in 3 tablespoons of curry powder and ¼ teaspoon of Indian chili pepper, then stir for roughly 1 to 2 minutes until fragrant. Add ¼ cup (63ml) of water or chicken stock and fully deglaze the pot with a wooden spoon. Add in remaining 1 cup (250ml) of water or chicken stock. Place all the goat shoulder with all the meat juice into the pot. Add 1/2 cup (125 ml) of tomato paste on top of the goat shoulder. Do NOT stir. Add in the quartered potatoes. Open the lid carefully, break up the potatoes to thicken the curry sauce. Stir in one tablespoon of chopped cilantro. Taste the seasoning and add in more salt to greatly enhance the flavors. *Pro Tip: we added 3 pinches of sea salt, please adjust accordingly! Here are the super brief conclusions from our testings. Choose the cooking time depending on how much chew you like the goat meat to have. High Pressure for 35 minutes, then Natural Release: the goat meat is moist, flavorful, and have some chew. High Pressure for 40 minutes, then Natural Release: the goat meat is moist, flavorful, and very tender. The cooking time and release method makes a huge difference on the goat meat’s result. If it’s done incorrectly, the goat meat will be very tough and dry. *Pro Tip: You don’t need to change the cooking time if you’re using thawed goat shoulder. Please use a high quality blend of curry powder as it’s the heart and soul of this dish. We bought ours in our local “Indian town”. But if you couldn’t find any curry powder, you can make your own from scratch. Our pressure cooker curry goat recipe is only mildly spicy. So, if you like your curries hot or very hot, adjust the spiciness by using ½ teaspoon (or more) Indian chili powder. Be cautious and don’t burn your throat as Indian chili powder is very hot. 4. Make More Rice or Naan! We ran out of rice soooo quickly as we were scooping the goat curry one spoonful after another. 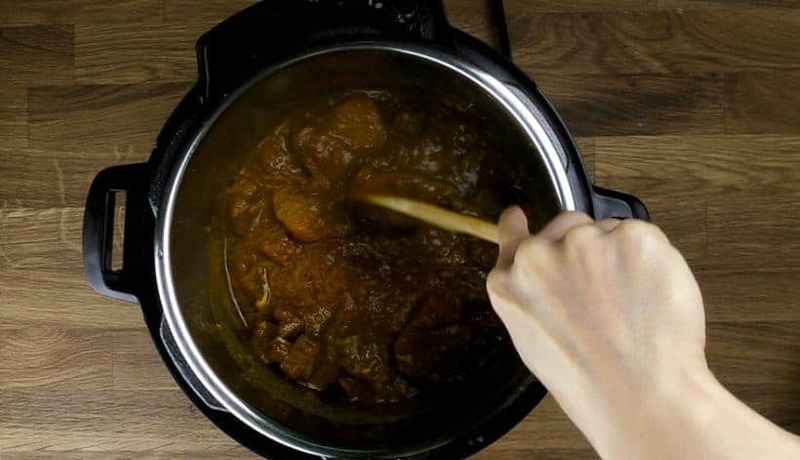 Now it’s YOUR turn to take out your pressure cooker and make some Indian Pressure Cooker Curry Goat Recipe! Make this super tender & moist Pressure Cooker Curry Goat exploding with depths of fragrances & flavors. 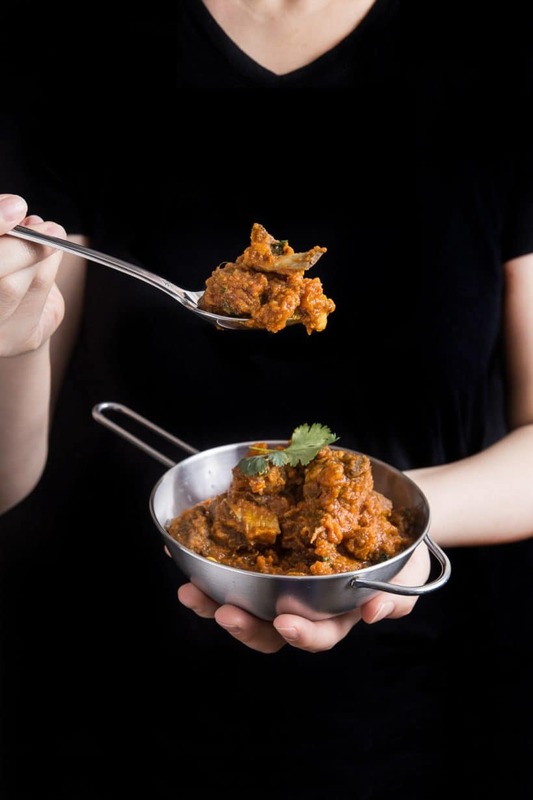 Prepare to be addicted to this thick and mildly spicy curry! Heat Up Pressure Cooker: Heat up your pressure cooker (Instant Pot: press Sauté button, then press Adjust button to go to Sauté More function). Make sure your pot is as hot as it can be when you place the goat shoulder in the pot (Instant Pot: wait until the indicator says HOT). If you are using frozen goat shoulder meat, be careful. Brown Goat Shoulder: Add 1 tablespoon of olive oil in the pot. Ensure to coat the oil over whole bottom of the pot. Add goat shoulder in the pot. Add in 2 pinches of kosher salt and black pepper. Then, brown the goat shoulder on all sides for a total of roughly 5 minutes. Remove and set aside. 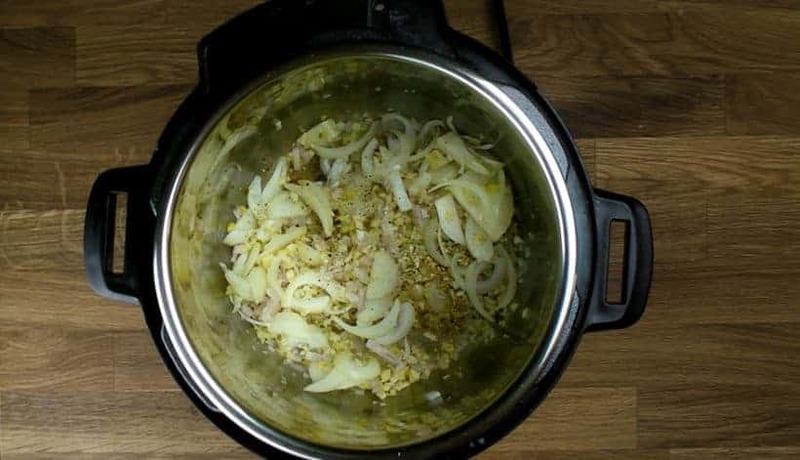 Sauté Shallot, Onion, Ginger, Garlic: Reduce the heat to medium (Instant pot: press Cancel button, then press Sauté button). Add 1 tablespoon of olive oil in the pot, then add in sliced onion, minced ginger and shallot, then stir for roughly a minute. Add the minced garlic and stir for roughly 30 seconds until fragrant. Mix Curry and Deglaze: Add in 3 tablespoons of curry powder and ¼ teaspoon of Indian chili pepper, then stir for roughly 1 to 2 minutes until fragrant. Add ¼ cup (63ml) of water or chicken stock and fully deglaze the pot. Add in remaining 1 cup of water (250ml) or unsalted chicken stock. 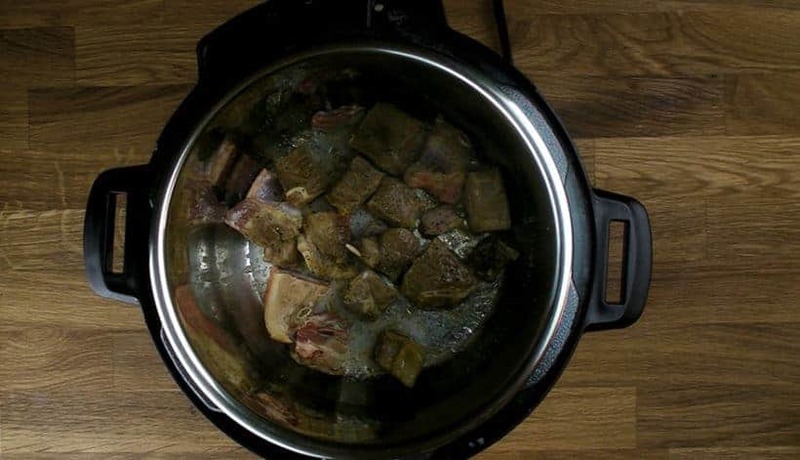 Pressure Cook Curry Goat: Place all the goat shoulder with all the meat juice in the pot. Add 1/2 cup (125 ml) of tomato paste on top of the goat shoulder. Do NOT stir. Add in the quartered potatoes. Close lid and pressure cook at High Pressure for 35 to 40 minutes (See tips section above). Turn off the heat and fully Natural Release (roughly 15 minutes). Garnish and Serve: Open the lid carefully, break up the potatoes to thicken the curry sauce. Stir in one tablespoon of chopped cilantro. Taste the seasoning and add in more salt to greatly enhance the flavors (Tip: we added 3 pinches of sea salt, please adjust accordingly). Serve immediately! 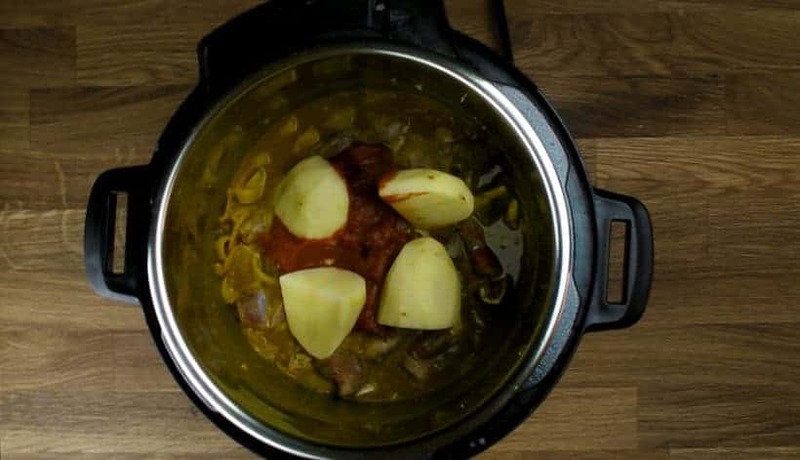 Potatoes: We used potatoes as a natural thickener to thicken the pressure cooker curry sauce. Spiciness: Our pressure cooker curry goat recipe is mildly spicy. If you like it hot or very hot, use ½ teaspoon (or more) of Indian chili pepper instead. Be cautious of the amount as Indian chili pepper is very hot. Hello, the only goat available to me is random frozen chunks of the whole body, or so im told. Should I still risk the recipe? Thanks. Could I use a goat leg instead of a shoulder? Any changes needed? Thank you for your question. If the goat leg is chopped into stew, you will want to increase the cooking time to 45 minutes and natural release. I have tried this recipe today. It is superb yummy. 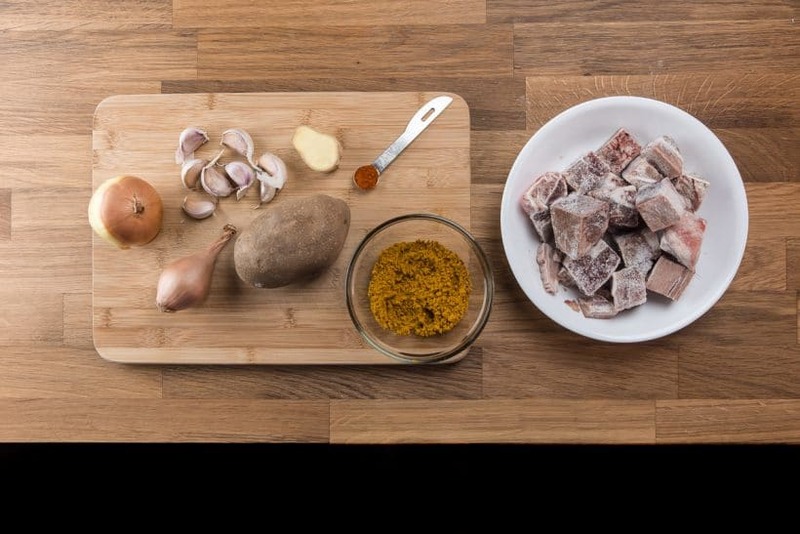 I also would like to know is this instant pot can be use to make tau foo Fa…. Hopefully we can have a tau foo fa recipe soon! I was just wondering if I could make this recipe with a whole piece of beef brisket. Would I still have to cut it into cubes and if so, how long would I cook it for. I have made this same recipe two times before using lamb and it has been to die for. It is my go to curry. I would brown the beef brisket as a whole piece first and then cut them into cubes. We are still doing some experiment on beef brisket, but it would take roughly 45 – 55 minutes + Natural release. This recipe looks delicious and I’m planning on cooking this for our Christmas Eve dinner. 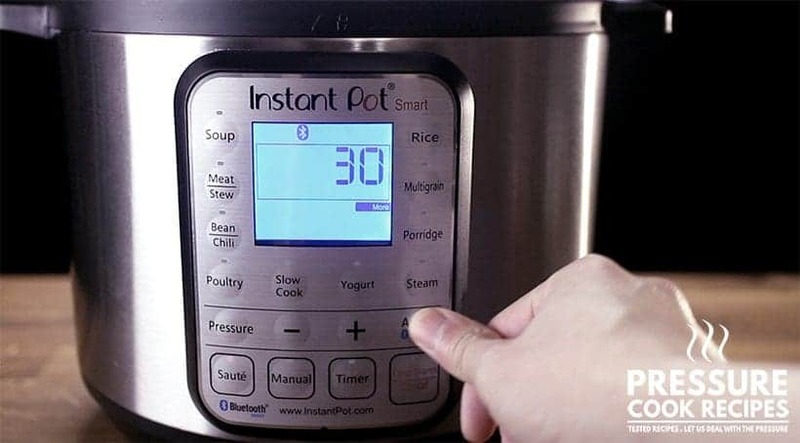 Can it be doubled and still fit in a standard size instant pot? Any special directions for doubling the recipe? Thank you for your fool proof recipes!! Doubling the recipe will fit just fine in the 6qt Instant Pot. I will recommend using the 35 minutes + Natural release time as the get up to pressure time will increase. The goat meat may extract quite a bit of moisture. If the floating pin doesn’t drop after 20 minutes, carefully turn the venting knob to the venting position to release the remaining pressure. Good and delicious curry, you guys are good. Can we make it same with camel meat. We haven’t tried it with camel meat. Please let me know if you do try it!! I have just finished making this curry. Good Lord, you guys are good. We must have the same taste buds as I just love all of your recipes. Three days ago I made the meat balls in tomato sauce and it was just to die for. Thank you for your recipes and your creativity and enthusiasm. Look forward to more new recipes in the new year. Merry Christmas to you and your family as well!! Looks great, but could I make this using chicken breasts? If so, what changes would I need to make? I would probably add in some garam masala for chicken breasts. It will only take 5 minutes + natural release to cook. Hi! Can I substitute the goat with lamp chops instead? How would I adjust the cooking time? Thanks! 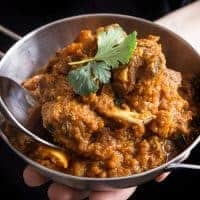 Lamb works great with curry! It will depend on how thick are the lamp chops. I would recommend shortening the time to 28 minutes if they are paper-thin. Tried it last night, it was SOoo Yum.. I used Lamb Stew Pieces instead since I couldn’t get lamb shoulder in the supermarket – worked perfect for me. For people who has Tefal C4M, 45 -50 minutes of cooking time is good enough (not including the prep time). Glad you got it working in the Tefal Cook4Me! Hi guys…I just used the Instant Pot for the first time tonight and made this meal. It’s amazing. I didn’t think this simple recipe could have pushed out such an aromatic delicious curry but it did!!! Thank you! Say I had to substitute lamb shoulder (goat’s hard to come by). How would the times change, or would they? If you are chopping up the lamb shoulder as stew, it will take roughly 25 – 30 minutes at high pressure. I’ve never had goat! But I’ve heard great things and this just convinces me even more that I need to hurry up and try it!! LOVING this recipe Amy & Jacky! 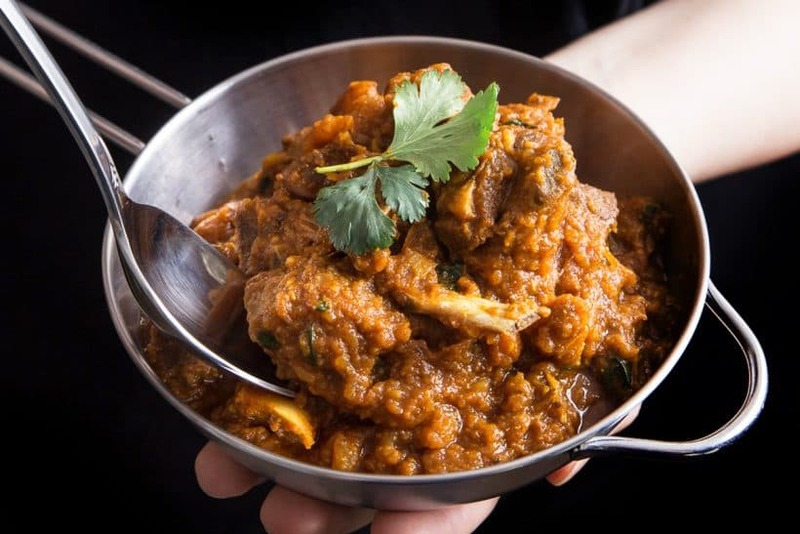 I`m all about Curried Goat & this looks AMAZING! Going on my to make soon list! Thanks for the great post! Thanks Tez! 🙂 Let me know how it turns out when you try it! This sounds so wonderful! I’m new to the pressure cooker and your directions are really helpful!